While attending VMworld US this time, I was invited by Stephen to participate in Tech Field Day Extra. I had recently enjoyed Cloud Field Day very much so I had to say yes. Actually, this presentation wasn’t one that I was actually scheduled to attend but I happened to be there at the time so thought why not. StorageCraft was founded in 2003 with a mission to provide reliable and affordable recovery for any business. 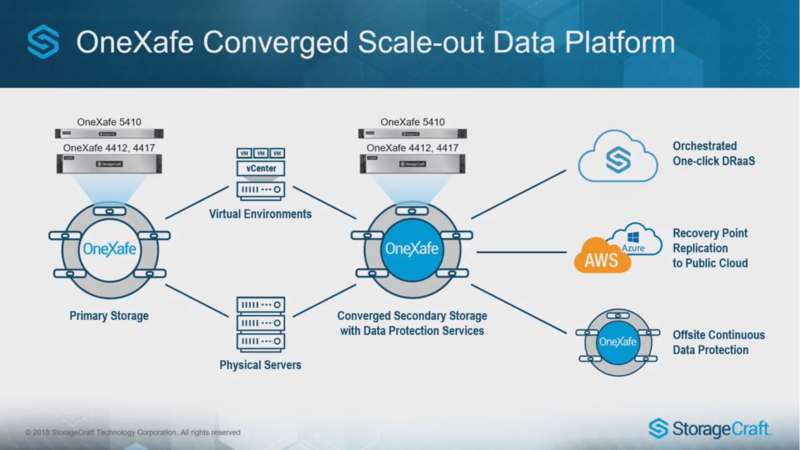 They participated in Tech Field Day Extra this time to introduce the recently released OneXafe (pronounced “OneSafe”), which is a hyper-converged scale-out device and ShadowXafe (pronounced “ShadowSafe”), that provides SLA-based data recovery. Working together, the solution aims to provide a fast and affordable recovery solution to SMB and Mid-Market organisations. OneXafe is a hyper-converged data protection appliance that comes in 1 and 2 U form factors and is aimed at SMB and Mid-Market organisations. Once data is ingested into the platform, ShadowXafe provides SLA-Driven data protection and primary storage for virtual machines and unstructured data. This release enables the capability to have host-based protection, in addition to agent-based protection in the past. Backups are taken using various native OS methods (depending on the OS) to take the best type of backup, for example, application or crash consistent. For other cases like physical machines, it uses a very lightweight agent to back them up. Other capabilities are similar to what other vendors provide e.g. protection of both physical and virtual machines, recovery to other hardware or environments and seamless integration to VMware etc. OneXafe also replicates to the public cloud or another offsite location and keeps the data in sync. One nice feature is a purpose-built DRaaS cloud environment, provided by StorageCraft as an option. 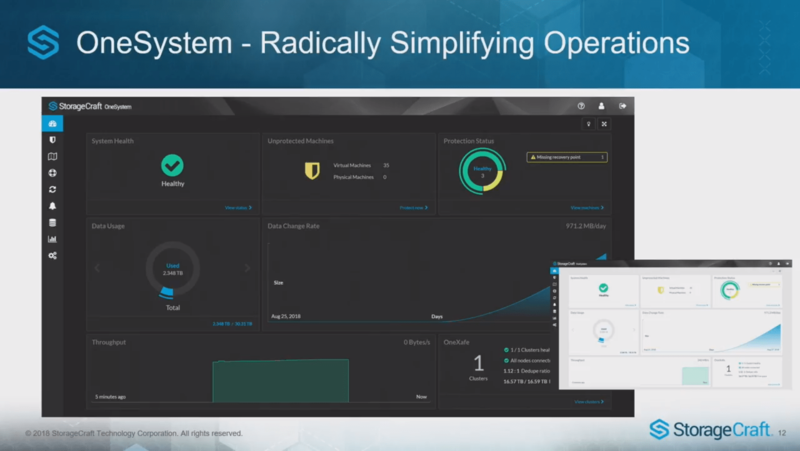 StorageCraft has worked hard on streamlining its operations console. The OneSystem (why not “OneXystem”?) interface consolidates all platforms the data exists on, SLA-based policy handling and reporting etc. into a simplified visual interface. The architecture is microservices based and components communicate via Google gRPC. StorageCraft has gone the microservices route to make the interface highly-scalable, flexible, platform-agnostic but also future-proof. Another benefit of this approach is that features essentially become plug-ins that one can switch on and off – not just from the interface but actually at the system level, making the whole thing nimble. This modularity also makes it easier (read quicker) to modify for new versions or updates. The star of StorageCraft’s offering, however, is HyperRestore and that’s due to the speed of restore. I was very interested in seeing the demo as StorageCraft claims to boot backup images as VMs in milliseconds – 20 milliseconds to be exact! I would urge you to look at this demo below where Junior Silva initially goes through some of the other features, before moving on to a live restore demo. The demo shows that upon triggering a restore, the virtual machine starts booting up immediately on primary storage. It is made possible by getting an initial part of the VMDK data placed on primary storage and while booting up, the process backfills all the required data by reading ahead from the backup storage. This is very different from traditional restores that recover a machine to some other location and upon completion, move the machine into the primary location before boot up. After booting and once important base data has been restored, the process only pulls data as required. In addition, the process is intelligent enough to know if the data being pulled is already on primary storage. If so, that’s where the data comes from. If not, it comes from other storage and written to the primary. This also means subsequent recoveries become faster, quickly getting to a point where every recovery becomes rapid. StorageCraft has worked a lot on the interface and made it very simple, visual and efficient. It shows you the recovery points and where they’re stored at a glance. In addition, you can set SLA policies for machines which determines how often they should be backed up and placement of the backup so that it can be restored in accordance with the SLA. StorageCraft’s focus is currently on VMware-based environments only but they are also planning to bring Hyper-V support soon. However, when asked about public cloud support, their answer was that they will be looking at feedback from the field before considering it. Having been in this industry for a while, I can interpret what that means. I’ve said this before and will say it again: Unless your focus is just your existing customers and only their requirements, there is absolutely no question that companies will want to have public cloud support coverage built into the product now. I know that resources are expensive and a company only has so much of it available. However, the reality is that it’s a race. Customers are thinking about their multi-cloud strategy today and companies that can’t provide the required support now will lose out to the ones that can or are making significant steps towards that support. In terms of hardware, configuration or scale-out capability, StorageCraft’s offering is not much different from other vendors. But from what I hear, the aim seems to be to target the SMB/Mid-Market customer with an attractive price point and enterprise-level features. If my assumption is correct then it’s a different proposition altogether. At a lower cost, SLA-based protection and instant recovery become very attractive capabilities, given how costly complex recovery and achieving narrow RTOs can be. I’ve haven’t seen the pricing myself so I can’t possibly say that for sure but that could be a major differentiating factor here. It was great meeting the StorageCraft team and the chat we had. I think this is a good option for SMB and Mid-Market organisations to start small with great features and grow gradually while keeping CAPEX in check. If cost was the barrier to adoption of hyper-converged backup technologies, it shouldn’t be anymore. Pity the replication piece (a common requirement)these days) doesn’t work at all!! !